HAND CRAFTED IN THE GOOD OLD USA. The full tang blade is made from the finest 420 HC STAINLESS STEEL materials. The handle is made from Micarta and fastened with 3 brass rivets (carbon fiber fabric in a thermo setting plastic creates an indestructible handle). Each knife is handcrafted and each blade is hand honed to give you an edge that delivers the sharpest cut every time. : Only hand wash your Pro Chef knife, washing through the dishwasher only leads to scrapes, dings and dulls your blade edge. : Store you Pro Chef USA knife in a safe place preferably a knife block. : Always use the right knife for the right task. : Do not use your knife as screwdriver or hammer. : Used for food preparation and never used to cut through frozen foods. : Please use proper wood or plastic cutting board surface when using your Pro Chef USA hand crafted knife and you can easily re-sharpen your knife with a whetstone. 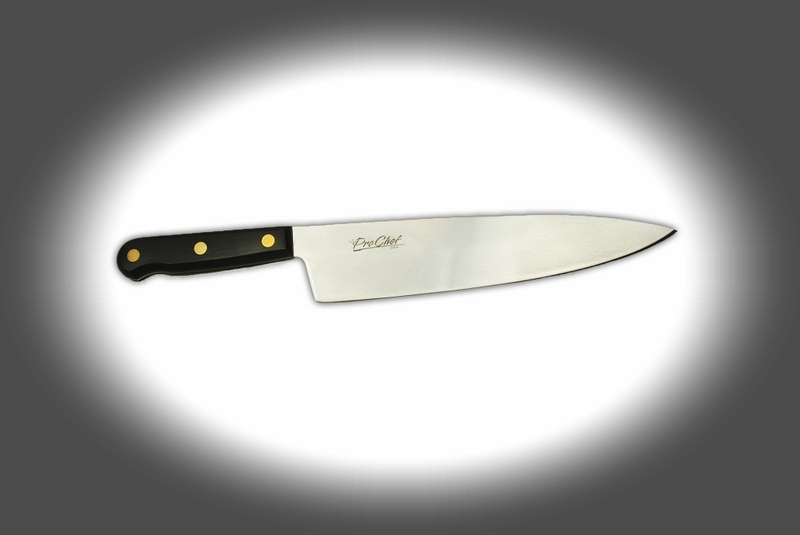 PRO CHEF USA CUTLERY WARRANTY: Lifetime Warranty against manufacturer defects does not include mis-use and abuse or normal wear and tear. Please follow all instructions included with this knife. 420HC Stainless steel is a grade that is commonly used in the commercial knife making industry. 420HC can be sharpened to a very fine cutting edge and a mirror finish. It is becuase of these reasons that 420HC became such a popular grade. 420HC has fair toughness and good corrosion resistance and can be hardened to RC 56-59.